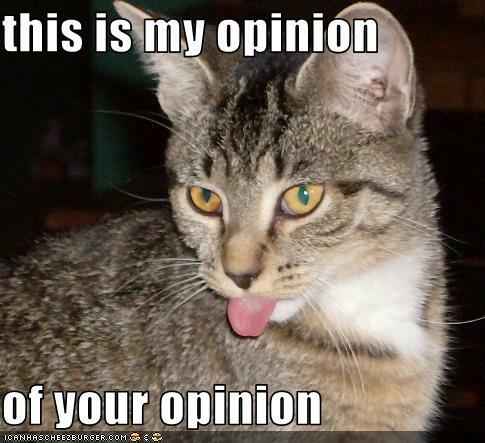 So by now I’ve spent four posts hammering the idea of opinion. I’ve talked about what it is, “your opinion“, “my opinion“, and the areas where we might think that it’s all just opinion. Something I’ve had to ask myself while writing these is whether or not there’s a use for opinion. I mean, I’ve been treating it like a four letter word for the most part.But I think there is. Opinion is synonymous with belief. If it’s your opinion that p, then it’s your belief that p, and vice versa. And having beliefs is obviously an incredibly important part of every day life. But since we all have opinions, and not every opinion is equal, we can’t dismiss an opinion purely on the basis that it’s an opinion. It’d be tantamount to saying “It’s my opinion that your opinion is just an opinion,” to which my seven year old niece would reply “Your opinion’s an opinion.” And rightly so. We have to look at it from another angle, which involves examining its justification. What reasons are there for holding that opinion? Are they good reasons? Is it true? We can have good reasons to believe something that isn’t true, after all. What I’m trying to say is that, in a discussion, if your interlocutor plays the opinion card, get a little suspicious. Maybe even a bit mad. It’s true that statements you make are opinions, but the fact that it’s true is utterly independent from whether or not those opinions are well-grounded or not. It’s my opinion that cats are mammals, but we don’t think that’s just my opinion, I’d hope. 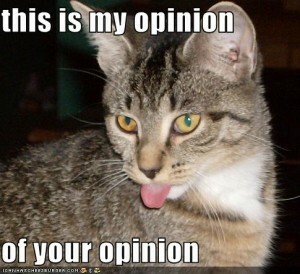 There’s a lengthy list of reasons to think that cats are mammals, and “It’s Jim’s opinion” doesn’t appear on it. They’re warm-blooded, have live birth, etc… You get the idea. Similarly, don’t play the card on yourself by saying “It’s just my opinion”. It might not be, there might be reasons that you hold it to be true. If there aren’t, that seems like it’d be something to be concerned about. Anyway, that wraps up opinion for now. Also, on a totally unrelated note, if you’re from Kitchener Waterloo or the surrounding area and you’re looking for something cool to do on Valentine’s Day, you should come out to Canvas & Candlelight, an event I’m helping to organize. It’ll be a night of painting, food, and fun and proceeds go to support local arts programs. Why do dinner and a movie when for about the same price you can have way more fun and support the arts?